Soltanzadeh, Hossein. (1395). Reasons for Creation of Important and Sacred Numbers and Their Reflections in Architectural and Urban Spaces. معماری و شهرسازی آرمان شهر, 9(16), 59-68. Hossein Soltanzadeh. "Reasons for Creation of Important and Sacred Numbers and Their Reflections in Architectural and Urban Spaces". معماری و شهرسازی آرمان شهر, 9, 16, 1395, 59-68. Soltanzadeh, Hossein. (1395). 'Reasons for Creation of Important and Sacred Numbers and Their Reflections in Architectural and Urban Spaces', معماری و شهرسازی آرمان شهر, 9(16), pp. 59-68. Soltanzadeh, Hossein. Reasons for Creation of Important and Sacred Numbers and Their Reflections in Architectural and Urban Spaces. معماری و شهرسازی آرمان شهر, 1395; 9(16): 59-68. Associate Professor of Architecture, Faculty of Architecture and Urban Planning, Islamic Azad University, Central Tehran Branch, Tehran, Iran. This research was an attempt to study reasons for creation of some of the important and sacred numbers and their reflection in architectural and urban spaces. This subject matter is important because significant and sacred numbers were used in design and construction of a number of historical spaces. The research objective was to discover some of the reasons for formation of important and sacred numbers and their reflection in architectural and urban spaces. The research questions are: How and why were some numbers considered important or sacred? How the important and special numbers are reflected in urban and architectural spaces? The research theoretical framework is based on the idea that important and sacred methods were used in design and construction of a number of architectural and urban spaces (especially religious spaces) as well as public spaces. The idea also holds that architectural and urban spaces are reflections of civilization and culture of the society they belonged to. The descriptive analytical research method and sometimes the historical-interpretative research method were used for this research, because the research data consisted of historical and qualitative data. 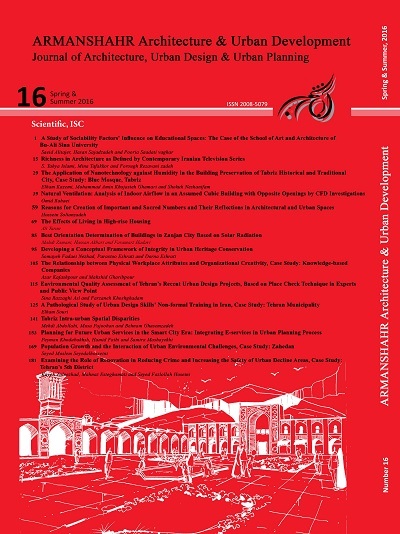 Architectural and urban spaces in Iran formed the dependent variable, and important or sacred numbers were the independent variable in this research. The statistical society mainly covered Iran, but examples of other important cultures are also referred to. Research results indicated that phenomena such as some of the numbers related to human organs, natural and cosmic system numerical properties of the earth, some of the structural qualities of geometrical forms, a number of religious events and phenomena, the internal structure and order of arithmetic, and relationships between numbers are factors influencing formation of important and sacred numbers. Ahsant, G. (1997). Tarkib Chalipa, Tehran: Yasavoli. Alneski, S. (1985). In the way of Pythagoras, (P. Shahriari, Trans), Tehran: Amir Kabir Alkashani, G. (1987).Tagh va Azaj, (A. jazbi, Trans. ), Tehran: Soroush. Alsaeed, E. Parma, A. (1984). Geometric Pattern in Islamic Art, (M. Rajabnia, Trans. ), Tehran: Soroush. Ikhwan Alsafa. (1992). Mojmalalhekmat, in “Three Persian Treatises on Music” (T. Binesh). Tehran: University Publication Center. Ikhwan Alsafa. (2008). Mojmalalhekmat, (M.T. Danesh Pajoh, I. Afshar, Edited. ), Tehran: Institute of Humanities and Cultural Studies. Brosious, M. (2006). The Persians. London: Routledge. Bunce, Fredrick, W. (2002). Numbers. New York: D.K. Print World Ltd.
Burckhardt, T. (1990). Principels et Methodes de Lart Sacre (J. Sattari, Trans. ), Tehran: Soroush Press. Burckhardt, T. (2010). Traditional Cosmology and New Science (H. Azarkar, Trans. ), Tehran: Hekmat. Cassirer, E. (1999). The Philosophy of Symbolic Forms (Y. Motghan, Trans. ), Tehran: Hermes. Critchlow, K. (2011). Islamic Patterns (An Analytical Cosmological Approach) (H. Azarkar, Trans), Tehran: Hekmat. Faranbagh Dadegi. (2001). Bundahishn (M.Bahar, Edited), Tehran: Toos. Danisari, S. (1971). Navader Altabador Letohfatoalbahador (M.T. Danesh Pajoh, I. Afshar, Edited). Tehran: Bonyad Farhang Iran. Ermavy, A. A. (1967). Music Paper Behjat Alrouh, Tehran: Iran Culture Fondation. Farabi, A. (1985). Ehsaeolome. (H. Khadivi Jam, Trans.). Tehran: Elmi Farhangi Publishing Co.
Ghiyath- al- Din, J. A. (1987). Tagh va Azaj, (A. Jazbi, Trans.). Tehran: Soroush. Gilgamesh. (1999).Translations of Texts by George Smith (D. Monshizadeh, Trans.) Tehran: Jajarmi. Godard, A. (1979). Iranian Art (B. Habibi, Trans. ), Tehran: National University of Iran. Grutter, J. (1996). Aesthetic in Architecture (J. Pakzad, Trans. ), Tehran: University of Shahid Beheshti. Hamedani, A. (1997). Alnoghteh Secrets (M. Khajavi, Trans. ), Tehran: Mola. Hami, A. (1976). Bagh Mehr, Tehran: Davarpanah. Ibn Khaldon, A. (1968). Muqaddameh (M.P. Gonabadi, Trans. ), Tehran: Bongahe Tarjomeh va Nashre Ketab. Kolayni, R. (1989). Osol Al-kafi (J .Mostafavi. Trans. ), Qom, Ahlal-Bayt Press. Lahori, M. (1867). Padeshahnameh (A. Maulavi, A. Abdulrahim, Edited). Kalkateh. Lings, M. (2002), Mystery High Kind (F. Sanaee, Trans. ), Tehran: Hekmat. Najm Razi. (1973). Mersad-Alebad (M.A. Riahi, Edited. ), Tehran: Bongah Tarjomeh va Nashre Ketab. Narshakhi, A.B.M. (1984). The History of Bokhara (Alghabavi. & M. Razavi, Trans. ), Tehran: Toos. Plato, (1972). Timaeus (M.L. Lotfi. Trans. ), Tehran: Kharazmi. Plotinus. (1987). The Works of Plotinus (M.H. Lotfi, Trans. ), Tehran: Kharazmi. Pope, A.U. (1986). Iranian Architecture (K. Afsar,Trans. ), Tehran: Yasavoli. Prada, E. Dayson, R. (1978). Iranian Ancient Art (Y. Magidzadeh, Trans. ), Tehran: Tehran University Press. Rahol, V. (1975). Buddism (G.Khatami, Trans. ), Tehran: Tahori. Schimmel, A. (2007). Decryption of Divine Revelations (A.Govahi. Trans. ).Tehran: Islmic Culturae Press. Schimmel, A. (2013). Secret Numbers. Tehran: Islamic Culture Press. Shirazi, Qutb Al-Din. (1990). Doratto-altaj, Tehran: Hekmat. Soltanzadeh, H. (2011). Taj Mahal. Tehran: Cultural Research Bureau. Soltanzadeh, H. (2011). Brief History of the City and Urbanization in Iran. Tehran: Chahartagh. Sohrevardy, Y. (2008). In The Fact of Love, Tehran: Mola. Taton, R. (1985). Account History (P. Shahriari, Trans. ), Tehran: Amir Kabir. Vejdani, B. (2002). Symbolic Numbers 7 and 12 in Iranian Music, Book of Month, No. 51. Vermazeren, M. (2011). Mithra,ce Dieu Mysterieux (B.Naderzad, Trans. ), Tehran: Cheshmeh. Zahedi, T. (1998). Spiritual Philosophy of Music. Tehran: Ferdows.